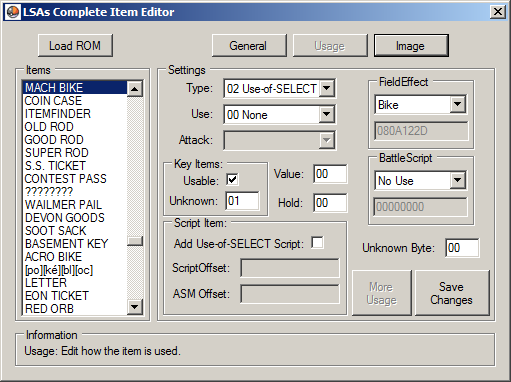 Complete Item Editor is a tool for hacking Pokemon third generation ROMs. Its sole purpose is to edit anything and everything about the items in the game. You can change the items; Name, Price, Description, Pocket, and the order Pokeballs are stored in the Ball Pocket. Item IDs automatically generated sequentially. Automatically repoints descriptions that are too large. You can change the items; Type, Usage Location, Field Effect, Battle Script, Value of effect, Hold effect, and the Attack held by a TM/TM. If you are creating a new item, you can add a script for it to run when used from the bag. You can change the location of the image if you have inserted a new one already. You can manually edit the palette or repoint it if you have inserted a new one already. Has lots of error checking to prevent you from making stupid mistakes. Single clicking an item will keep you on the same page. Double clicking an item will move you to the General page. Supports BPRE, BPGE, AXVE, AXPE, BPEE and most hacks based on any of them it tables have not been repointed. Image options are unavailable for AXVE and AXPE because they don’t have item images. You can select which battle effect you want from a list instead of using offsets. You can also select the field effect from a list. Custom offsets are still an option(don’t worry). Added a “More Usage” button under the Usage section. Much Error correction to protect your ROM from silly mistakes. Allow users to edit and save new images for their custom items.